"If, after all of this you think I'm completely out to lunch on this review, I'll make the following offer: buy the book, read it"
Just joking of course... Anyway, I really appreciate the review. I own 3 of Neyer's books already (and enjoyed each one) and will probably pick up this one at some point too, once my semester ends. Stealing books is so much more difficult these days. Everybody's got all of this new fangled technology, and I'm sure they have tiny little Lojack chips in the paper. I'll have to wait until this hits the library. Rob was kind enough to shoot pool with me once, but I can't spend food money on his book. I'll cut him a deal: I'll buy his (and read it) if he promises to buy mine when it eventually comes out. I had this book pre-ordered from Amazon for a couple months and it shipped yesterday, so I am anxiously awaiting it. I do already own all of Rob's books and actually found Feeding The Green Monster my favorite thus far. I am perhaps the only one who thinks that, by the way. If this one is close to what you describe, Shyster, I don't think anyone will be disappointed. Thanks for the review. I can't wait to read the book. I was curiously awaiting the release of this book, always telling myself I'd pick it up if I got a bookstore gift certificate and remembered it. After reading this review, I'm going to pick it up on my lunch break today. And pay cash. Thanks for all you do, Shyster. im not sure im on board for bill james contention that people at newspapers 50 or 100 years ago didnt share our concept of what a 'journalist' was. i understand that things like stats in the sports pages werent considered with the same importance as they are today, or at least, the editors werent as concerned with their accuracy, but if some writer gets the count, the inning, whos on deck or anything else wrong with a description of an event that 50,000+ people watched live than that paper is going to have some serious credibility issues. i mean, the business of newspapers was a mature industry a hundred or more years before baseball even existed. they had libel and slander laws, and they certainly understood the word 'journalist'. i get james' point, but i have the feeling he's exaggerating the extent of how 'loose' papers dealt with obvious facts. I've read most of Rob's books, and while I tend to enjoy all of them to some extent or another, I haven't enjoyed any as much as "Feeding the Green Monster". And I don't particularly care for the Red Sox, either, it was just a great read. Ken -- I think that "journalist" bit is just the latest example of James ranting about one of his favorite subjects, which is the rise of "professionalism." He has an essay in NBJHBA about how "educators" used to be simple teachers, "custodians" and "sanitation engineers" used to be janitors, "journalists" used to be reporters, etc. etc. In light of that essay, I think what he's saying here is not so much that they weren't accurate or responsible 50 years ago as much as he's saying they weren't so damned serious about it, elevating ethics and sourcing and all of that to the level of medical ethics. Not saying I agree with that, but that's what I think he's saying. ok, fair enough. pehaps james' has earned himself a little slack. what you brought up tho makes me wonder if high school guidance counselors could have ever been called anything else that would possibly imply them being even more worthless than they are currently perceived. i find it important to hold a profession that actually makes a difference in peoples lives. thats why i manually masterbate farm animals for artificial insemination. The saddest part of all of that Ken, is that even if that WAS your real job, you'd bemaking a greater difference in people's lives than I do (at least at my day job). Ken, how funny! I just posted a Kevin Smith related comment at The Cardboard Gods and then I come over here and see yours. Glad to see he's still relevant. Craig, you've put me in a bind here. 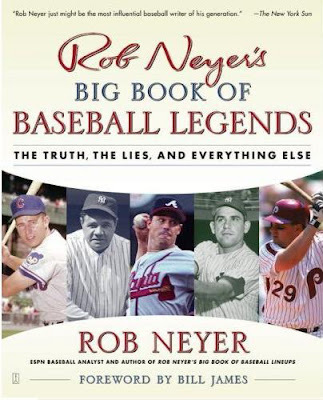 By writing such a solid review of the book, you've left me to either write one for my site -- www.DailyFungo.com -- as planned, knowing it will pale in comparison, or to not write one at all and look even more lame. As promised, I bought it over lunch and spent the balance of my break reading it. I didn't even eat. Excellent book with wonderful stories. I may need to get a second copy of this for my dad, too. What's with all this book writing that people are doing? Couldn't Rob put different chapters on his WWL blog every day so I wouldn't have to actually read a book? Who wants to sit and do that?